The F-100 was the USAF’s first operational aircraft capable of flying faster than the speed of sound (Mach 1) in level flight. The aircraft made its initial flight on May 25, 1953, and the first production aircraft was completed in October 1953. North American built 2,294 F-100s before production ended in 1959 with the F-100F models. Designed originally to destroy enemy aircraft in aerial combat, the F-100 became a fighter-bomber. It made its combat debut during the Vietnam War where it was assigned the task of attacking such targets as bridges, river barges, road junctions, and cantonment areas being used by infiltrating enemy soldiers. As tactics developed, the F-100F became an important aircraft for two new missions – surface-to-air missile (SAM) suppression, known as “Iron Hand”, and high-speed forward air control (FAC), known as “Misty FAC”. The F-100C aircraft on display here featured such advances as an in-flight refueling system, provisions for extra fuel tanks and bombs under the wings and an improved electronic bombing system. 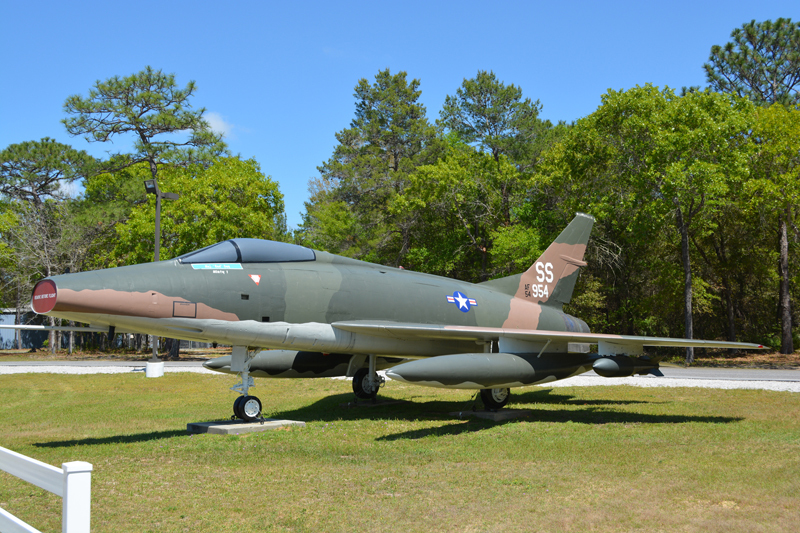 This F-100C S/N 54-1986 was last flown by the Armament Development and Test Center at Eglin AFB. This F-100C is being depicted as F-100F S/N 56-3954 flown by Col (then Major) George “Bud” Day. On 26 August 1967, Major Day was flying a “Misty FAC” mission when he was shot down. He was captured and held as a Prisoner of War for the next 67 months. On March 4, 1976, Colonel Day was presented the Medal of Honor by President Gerald Ford.